Looking to get out in the fresh air and go on a bicycle ride with your infant or toddler? Now you can, thanks to the variety of baby bike carriers available today. We’ve done the research for you, putting at your fingertips the top-rated baby bike seat options to ensure your child rides safely and comfortably on your bike. Just like bicycles come in different designs and styles, so do bike child seats. In this buying guide, you’ll be able to compare options for the three different baby seat for bike types: front frame, rear frame and rear rack. Type of Bike: There are many different types of bikes, such as road bikes, cruiser bikes, mountain bikes, touring bikes and racing bikes, to name a few. What type of bike you have is a key factor in determining which baby saddle to buy. Not all bicycle types are compatible with front frame, rear frame, or rear rack seat styles. 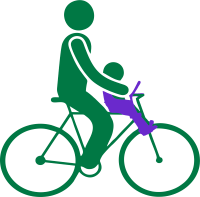 Age and Weight of Your Child: In order to ride on your bike, your child must be able to sit upright without support. Some states require a child to be 12 months old before riding in a seat on a bicycle. Most infant bike seats start at 9 months and range up to 3 years. Others vary in weight, with limits ranging from 35 to 45 pounds. Performance: The type of suspension is very important. The seat’s suspension matters in minimizing bounce when you ride over bumps. Look for a suspension flex of between one to three inches, which provides the best cushion. 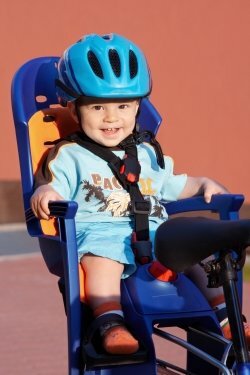 Safety and Comfort Features: Some baby bike chairs offer more safety and comfort features, like adjustable footrests, recline positions, easily adjustable shoulder straps, a comfortable seat design, safety bumpers, windscreens and handlebars. Not sure which type of child seat to get? To help you make an informed decision, read on for additional information and check out our reviews of the highly rated baby bike seats. You’re sure to find the best one to meet your needs so you and your baby can enjoy a bike excursion riding together. Front frame, rear frame and rear rack are the three types of child bike carriers, named for how they attach to the bicycle. Not all types of baby bicycle seats fit all types of bicycles, so it’s important to know which ones are compatible with your bike. A front frame baby bike seat is for youngsters ages 9 months to 3 years or up to 33 pounds. The seat mounts just below the handlebars, so the baby rides nice and close between your arms. These types are best for bikes where you ride upright, versus forward-leaning. A rear frame child bike seat is ideal for longer bike rides and taller babies ages 9 months to 6 years or up to 48 pounds. It’s installed on the bike’s frame, minimizing bounce when riding over bumps. These types have more features than front frames, like recline positions and footrests. A rear rack baby bike seat is mounted on a bike rack over the rear tire. It’s good for taller youngsters ages 9 months to 6 years or up to 48 pounds and is useful for longer rides where the child may fall asleep. These types have good suspension. Features like a high seat back, a handlebar, recessed helmet pocket, and adjustable safety straps and footrests, enhance the safety, comfort and performance of a front mounted baby bike seat. A bonus feature is a windscreen to block strong breezes as you ride. A common feature found on the top rated front frame seats is a lightweight design. The Thule Yepp Nexxt Mini baby bike seat combines both safety and comfort. 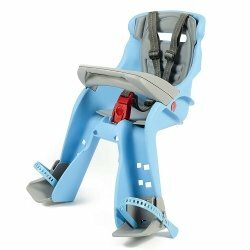 You’ll get lots of usage out of this seat because it’s designed to grow with your child, with an adjustable 5-point harness, adjustable footrests and foot straps. Tested for youngsters ages 9 months to 3 years old or up to 33 pounds, this child bike seat is lightweight, yet sturdy enough to handle rougher terrain. The Thule Yepp Nexxt Mini is quick and easy to install. Its universal quick-release bracket allows you to install the seat when you need it and remove it when you don’t. The seat is shock-absorbing and padded for a soft ride. It has a tall back, which adds good support, no matter your child’s height. The childproof, magnetic safety buckle ensures your child rides securely. A nice comfort feature is the seat’s handlebar, which gives your child something to hold while riding. The seat is made from water-repellent fabric that is easy to clean. Since it installs on the bike’s stem below the handlebars, the Thule Yepp Nexxt Mini is not compatible with every bike. The shoulder straps have some issues. First, they tend to start slipping off during the ride, especially on smaller children. Some parents resolve this issue by getting a car seat chest clip. The other issue is the lack of shoulder strap height adjustments. As such, the shoulder straps might fit too tightly on older or taller children. With its universal bracket, the Thule Yepp Nexxt Mini is one of the few front frame baby bike seats that fit most bicycle types. It isn’t made for carbon-framed bikes and won’t fit all bikes, so you’ll want to double check compatibility before buying. It’s extremely lightweight and easy to use. The seat is comfortable for long rides and has nice features, like a shock-absorbing seat, seat vents, footrests and a handlebar. In most cases, the seat’s positioning doesn’t interfere with the rider or pedaling. And, because it is so lightweight, it’s a breeze to make turns or bike up hills. Overall, youngsters really enjoy riding in this front frame carrier and parents love having them in front and within sight. Parents can’t stop singing the praises of the Mac Ride. Not only does it install and uninstall in less than a minute, it’s perfect for bikes that typically can’t accommodate a front frame bike seat. It has an open design, with no seat back or sides, harness straps, or handlebars. Your child sits on the seat between your arms, feet strapped in the footrests and hands holding the bike’s handlebars. Designed for children ages 2 to 5 or up to 60 pounds, its adjustable footrests and foot straps grow with your child, ensuring plenty of bike riding adventures together. This baby bike saddle and its mounting bracket are extremely lightweight, so there’s no worries about it hindering your handling of the bike. The Mac Ride is ideal for traveling. Simply use the included hex key and fold it into your backpack or suitcase. While its open design makes it adjustable for all bike types and sizes, it also allows your child to be more immersive in the riding experience. The seat and its components are well-built and durable, allowing for rides on rough terrains, like mountain trails. It’s ready to perform, wherever your ride takes you and your baby. The open design may not be suitable for young children who like to wiggle about or move around. With no harness straps, they may need to be reminded often to sit still and keep their hands on the handlebars. Depending on the design of your bike, your child’s hands may move on the handlebars and accidentally shift gears or apply the brake. The suspension isn’t that great on very rocky terrains and may cause your child to bounce about. With some bikes, the legroom might be tight, making it a bit challenging to pedal. The open design gets high fives from the majority of customers. While parents might be a bit nervous at first, they adjust to it quickly. And, all report that their youngsters love the ride it provides compared to other models. The open design also allows the seat to be easily installed on different types of bikes, a plus for families with more than one bike. Overall, customers are pleased with the seat’s high quality and ease of use. Many agree the exceptional quality makes it well worth the price. With its innovative mounting bracket, the Peg Perego Orion solves the problem of feeling off-balance when riding with a front frame baby seat attached to your bicycle. Installed on the bike’s head tube, the seat fits most bike frames, including electric bicycles. The one-click installation design makes attaching and detaching the child seat quick and easy. A huge advantage of the Orion is its suspension system, which minimizes bumps on all types of terrain. 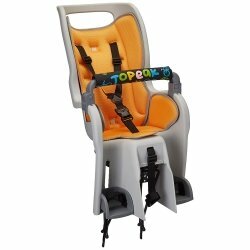 This is a ride along seat that’s ready to provide your child with a safe and comfortable ride. The Peg Perego Orion is well-made and sturdy for long-lasting durability. The seat surrounds the child on all sides to prevent injuries. The seat can be attached and removed from the base in just seconds. And, the base bracket is small and lightweight enough to leave on all the time. The adjustable footrests have safety straps that adjust as your child grows and keep feet out of the way of the bike’s wheel spokes. The thermoformed padding where the child sits is ample and comfortable. Plus, it’s waterproof and easy to clean. The Peg Perego Orion is limited to children ages 12 months to 33 pounds. Additionally, the detachable handlebar can be used only until the child reaches 22 pounds. There’s only an adjustable 3-point harness, which does not provide as much restraint as a 5-point harness. Bikes with cantilever style brakes might not be compatible with this seat because of the positioning of the front brake cables. Others might find installation tricky depending on the location of the bike’s gear cables. The seat also might not sit securely when mounted on a women’s bike. Customers describe the performance of the Peg Perego Orion as superior. It is well-built and has valuable safety and comfort features. Major pluses are the quick-release seat, the numerous adjustable settings on the footrests and shoulder straps that don’t slide down during the ride. 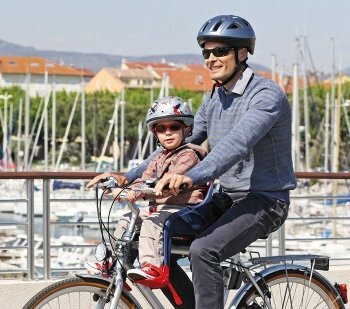 While it is a smaller seat that only accommodates youngsters ages 12 months to 33 pounds, it is more versatile in fitting more types of bikes. Price-wise, it’s one of the best for those on a budget who don’t want to sacrifice quality, performance, comfort, or safety. Easy removal of the seat when not in use, a design focused on safety and comfort, and a good suspension system for a smooth ride factor into an all-around good rear frame seat. All the top rated seats also have height adjustable shoulder straps, a recline position with a recessed helmet pocket, and adjustable footrests and foot straps. The Hamax Caress child bike seat is loaded with safety certified features for a carefree ride. Plus, it comes with a safety reflector and anti-theft locks. The seat fits babies ages 9 months and kids up to 48.5 pounds. It is constructed with a recessed indent to prevent your child’s helmet from being pushed forward. What sets this child bicycle safety seat apart from others is its single-handed operation. You can adjust the safety harness straps, recline the seat, or adjust the footrests and foot straps while keeping one hand on the bike. The Hamax Caress has great suspension with its shock absorbing steel frame mount, providing a smooth ride over all terrains. 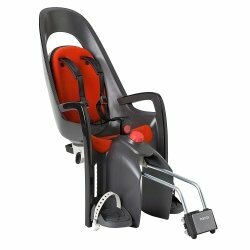 The seat offers several recline positions from 0 - 20 degrees, so your child can nap during the ride. And, the seat’s padding is removable for easy cleaning. Everything is adjustable to grow with your child. The backrest glides up or down to fit your child’s height. The footrests have 10 height options, and the fasten and release foot straps have slide and click adjustment. Finally, the non-slip shoulder straps easily adjust and stay on the child over bumps and turns. The seat’s padding is thin and may not be that comfortable on long bike rides. In the recline position, a baby’s head may slump or move about too much while sleeping. There’s no front handlebar, so small children have nothing to hold on to during the ride. The seat may feel wobbly from side to side, even when secured correctly. Proper balancing may require buying additional mounting brackets. Learning how to adjust the footrest height and recline angle can take some time. Fitting the harness over a child’s helmet may also be difficult. The Hamax Caress bike seat is easy to install and has a quick-release mechanism for easy on and off. It has two mounting options to accommodate most bike frames with or without an existing rear rack. This seat gets rave reviews for its safety-centric design and for making everything easier to use with its one-handed adjustable features. It is well made, sits securely on the bike, and has great suspension for a comfortable ride. Along with great customer service from Hamax, it is this excellent quality that makes this child bike seat a great value for the price. The Thule RideAlong Lite rear frame baby bike seat emphasizes safety, comfort and fit. It was designed and tested for use by children ages 9 months to 6 years old or up to 48-1/2 pounds. Some notable features are its dual beam suspension system for a smooth ride, a 3-point safety harness and safety buckle, and protection wings to keep your child’s hands out of harm’s way when dismounting the bike. True to Thule’s reputation for high quality, this rear mount child bicycle safety carrier is very well constructed and compatible with most round and oval bike frames. The Thule RideAlong Lite mounts somewhat easily to the bike and the seat has a universal quick-release bracket for quickly and easily removing it when not in use. 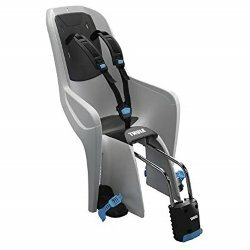 The sturdy shoulder straps stay put and the foot straps and footrests are easy to use and can be adjusted using just one hand. The seat provides all-around comfort and protection with its deep, thick and durable plastic shell. It is well padded on both its back and sitting areas. It has a well-designed suspension system that features long steel rods that act like springs over bumpy terrain. Although Thule says the RideAlong Lite fits most bicycles, it doesn’t fit many women’s frame bikes or bikes with rear derailleur cables. In some cases, the seat’s clamp pinches the cable, or with women’s bikes, the seat hits the rear wheel. This occurs even with the low saddle adapter, which can be purchased separately. The footrests can be difficult to adjust properly, so much so that some children can effortlessly pull their feet out of them if not adjusted tight enough. The Thule RideAlong Lite gets lots of love for its great design, quality build and ease of use. It’s quick and easy getting your child strapped into the seat and adjusting the straps and buckles for a secure ride. Speaking of the ride, the suspension is top-notch thanks to the dual beam suspension system. It absorbs road shock like a pro. While it may cost more than others, the RideAlong is well worth it. It integrates the strength, durability and quality factors that Thule is known for and will provide many years of bike riding enjoyment. The sleek and modern design of the Thule Yepp Maxi standard rear frame baby bike seat offers the functionality you need for everyday riding. It’s water repellent and has a shock-absorbing seat. Made for youngsters ages 9 months to 6 years old, or up to 48-1/2 pounds, the rear seat mounts on the bike’s seat post. (Note: The Thule Yepp Maxi Easyfit is for bikes with an existing rack). Built for long rides, the Yepp Maxi has a padded 5-point harness that is adjustable as your child grows, as well as adjustable foot straps and footrests. The molded foam seat has a durable steel frame, yet is super comfortable. Air holes on the seat’s back provide good air circulation in warm climates. The seat lock is great, allowing you to secure the seat on the carrier while you go into stores, restaurants, etc. Among the numerous safety features is the added protection to keep your child’s feet away from the bike’s rear wheel. The built-in reflector and a connection for attaching a safety light are great for improving visibility. Since there’s no fabric padding, cleaning the seat is a matter of simply wiping the dirt way. Installation takes at least 30 minutes and can be a bit tricky. Also, the seat is not interchangeable between the Thule Yepp Maxi and the Thule Yepp Maxi Easyfit. The shoulder straps tend to slide off the shoulders of children whose size is between settings on the harness. Additionally, the anchors that secure the straps to the seat’s metal frame are plastic, rather than durable metal. The back of the seat does not recline and there is no handlebar for kids to hold. In terms of style, design and functionality, this is one of the best on the market. It is definitely a good value for the price. It has all the safety features you expect, including the more secure 5-point harness, plus great suspension and additional functionality for those using it every day. The Yepp Maxi is so well-built that once your child outgrows it, you can use it again for a younger child or hand it down to someone else. 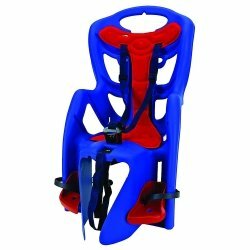 The CyclingDeal Kids USA Standard rear frame baby bike seat certainly lives up to its name as a deal for cycling enthusiasts. Its low price is a great deal, plus the seat provides great protection and comfort. The seat is compatible with bike frames with round seat tubes and includes adjustable metal rails to attach to the bike’s seat post. It also comes with a safety helmet for your child. 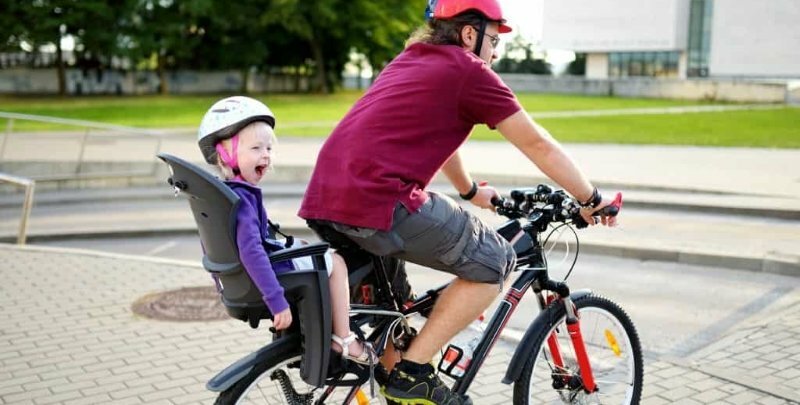 Designed and tested for children from 9 months to age 4 or up to 40 pounds, it’s an awesome carrier for taking your youngster along on bike trips. The 3-point harness has a childproof triple button clasp. Additionally, the built-in safety belt has slits for adding another waist strap for more protection. This is a good feature for those who do adventure biking. The double shoulder safety belt has pads to prevent it from slipping off your child’s shoulder. There’s also a yellow strap to prevent the seat from moving off the mounting rack. With the CyclingDeal seat, there’s plenty of room between the rider and the seat. Plus, the seat features a handlebar for your child to hold during the ride. This carrier does not work on dual suspension bikes, some women’s mountain bikes, beach cruisers, or rear suspension bikes. The instructional manual does a poor job explaining how to install the seat. You need a wrench, a screwdriver and lots of time to install the mounting rack to your bike’s seat tube and rear wheel bolts. When the seat’s not in use, you can unclamp it from the mounting rack, but the mounting rack, which is rather bulky, remains on your bike. Most people are surprised at how safe and comfortable the CyclingDeal Kids USA Standard is for such a low price. Yet, little is sacrificed with this budget baby bike seat. It may be a basic seat, but it has sturdy seat attachments and all the important safety features, including a 3-point safety harness, foot straps and a handlebar. Installation takes some time to figure out, but once the seat is on, your baby will want to go bike riding with you everyday in this comfortable child cycle seat. Good suspension and being lightweight, yet study are key features of highly rated rear rack mounted seats. The best of the bunch are also equipped with important safety features, like either a 3-point or 5-point harness safety strap, a supportive backrest, adjustable footwells, and guards to protect against the bike’s moving parts. Comfort features range from a padded handlebar to a recessed seat back. Just like its premier bicycles, The Schwinn Child Carrier is built for safety, comfort and performance. It comes with its own rack, so you don’t need to buy a rear rack for your bike or use its existing one. It’s quick and simple to install, with only a screwdriver needed to mount the rear rack. The seat sits above the rear wheel of most adult bicycles. Plus, the seat is vented, so there’s no wind drag to pedal against. This lightweight rear rack baby bike seat is designed for children ages 1 and older, or until they reach 40 pounds. This rear rack mounting bicycle carrier has top-notch safety features, including a 3-point harness, a padded cross bar, a removable headrest, leg restraints, adjustable footwells, and both seat spring and bike spoke guards to protect your child’s hands from the bike’s moving parts. The seat is sturdy and comfortable for long bike rides, with support padding on the backrest and an air-cushioned pad on the seat. If you want to use the seat on other bikes, simply call Schwinn to order an additional rear rack. Then, all you have to do is slide the seat on and off the racks. The seat is not designed for bikes with rear suspensions. It is also not designed to handle really bumpy rides, such as on dirt roads or trails with rough terrain. Although the shoulder straps are adjustable, the harness lacks a clip to hold them together. As a result, the shoulder straps may slip off your child’s shoulders. The Schwinn Child Carrier is a great rear rack child seat for the price. It allows everyone in the family to ride together and lets your young one enjoy the sights in comfort and safety. The seat and mounting rack are easy to install and use. And, because the seat is lightweight and well-balanced on the rear rack, it doesn’t throw off your center of gravity. The numerous safety features and comfort features, including a headrest, backrest and padded handlebar, let your child ride securely and comfortably in the back of the bike. Made in Italy, the Bellelli Pepe Clamp Fit baby bike seat is designed for a rear bike rack and fits children ages 7 and younger or up to 50 pounds. The seat clamps onto your bike’s rear rack, purchased separately if your bike doesn’t already have one. It’s simple to put on and take off with its quick release anchoring system. Parents will love that the water resistant seat is made from nontoxic plastic. 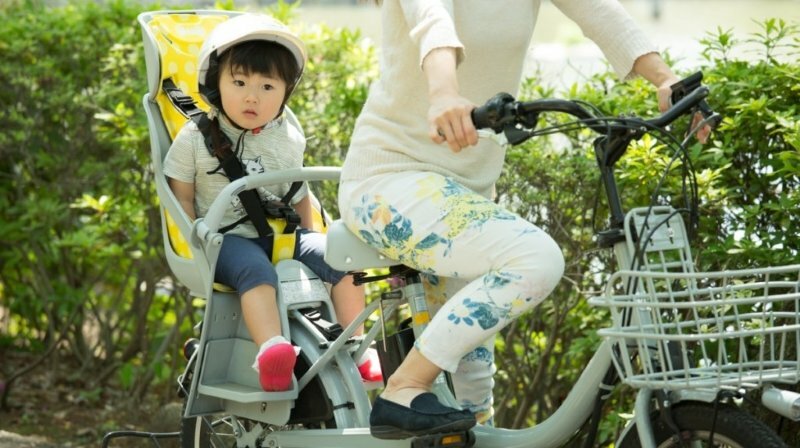 Known for its advanced safety and comfort features, this bicycle baby carrier is sure to give your child a safe and enjoyable ride. There’s a double layer of safety with the seat’s installation. Besides securely clamping to the rear bike cargo rack, there’s a front strap for securing the seat to the bike’s seat post. 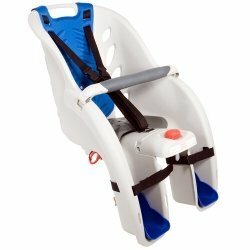 The 3-point safety harness comes assembled and is ready to adjust to your child. Once you hear the snap, you know the harness is secure and childproof. The seat’s high sides provide enhanced support and comfort. Additional comfort is provided by the ergonomic shoulder support and adjustable footrests. Plus, the open sections on the backrest not only enhance air circulation, but reduce wind drag. There is no handlebar, so your child has nothing to hold on to during the ride. On some bikes, the leg guards may touch the bike’s tire or brakes. However, moving the seat forward could solve the problem. The seat might not be compatible with certain women’s bikes. The Bellelli Pepe Clamp Fit rear rack child bike saddle comes highly recommended. It’s lightweight, yet very sturdy and built with safety and comfort in mind. Everything is ready to go right out of the box. It’s just a matter of sliding the seat onto the rack and tightening the clamps. This is a seat you will use for quite some time, meaning you will definitely get your money’s worth from it. There’s plenty of room between you and your child to allow for your child’s growth and ensure a fun and comfortable ride. Designed for children up to 48-1/2 pounds, the Topeak Baby Seat II sets itself apart with its wraparound seat and innovative suspension system to minimize bumps or jerky motions. It comes with a rear rack that fits on bikes without disc brakes. A disc mount rack is available to purchase for bikes with disc brakes. The seat offers a lot of value for the price. It combines a wide range of safety and protection features in a design built for comfort, convenience and ease of use. It’s a good all-around seat that will provide years of smooth rides. The seat has a slide lock mounting system that makes it super easy to attach and remove from the rack by pressing a button and sliding the lock. The safety and protection features are vast, including a shoulder harness with multiple height adjustments, adjustable footrests with foot straps, and a rear reflector. This seat also has some nice conveniences, like a padded handrest for your child to hold and a recessed seat back so your child can recline for a nap. There’s also a roll bar for added head protection that, off the bike, becomes a convenient carrying handle. The seat might not fit well on smaller road bikes. With other types of bikes, you may have to raise your bike seat to accommodate it. The screws that are provided with the seat may not fit the threaded holes on your bike. As such, you may need to purchase a different screw size at your local hardware store. The Topeak Baby Seat II gets high marks for its design, safety features and smooth ride. The seat’s recessed area was particularly noted for providing extra room to fit the child’s helmet and prevent forward slumping. Also appreciated is the full body cocoon design, which, combined with its suspension system, can handle all types of terrain. The seat’s pad is removable, so cleaning is quick and easy. 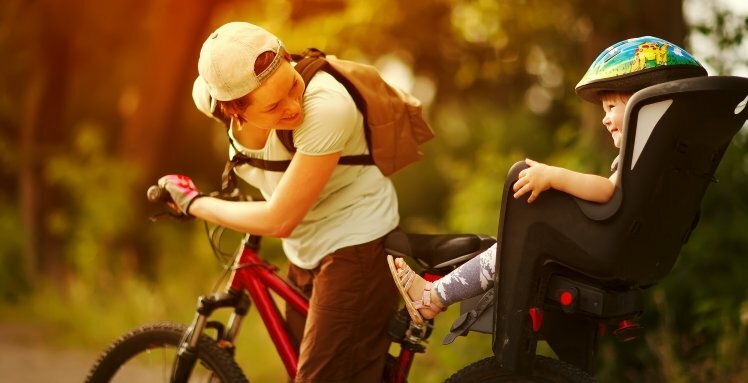 This rear rack mounting baby bike carrier is a great investment if you’re looking for the maximum in safety and comfort to protect your child as he or she rides along with you. Will the baby bike carrier fit my bike? Will my child fit in the seat? Is the child seat safe? Will I be able to ride with the extra weight on the bike? 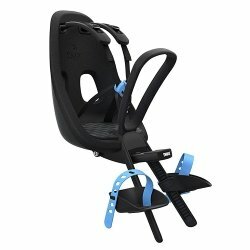 How do I decide which baby bike seat is best? With so many different types and brands and so many different price points, it can be difficult deciding which one to choose. That’s where this shopping guide comes in. It takes you through every stage of the buying process so that you end up with a baby bike seat that’s the right fit for you and your child. First, let’s start with the pre-shopping decisions. Is My Child Old Enough to Ride in a Baby Bike Seat? Just like car seats are regulated by the federal government, baby bike carriers are also regulated to some degree on the state level. 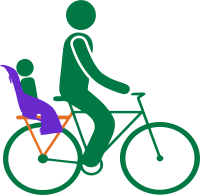 Some U.S. states have laws that require children to be nine months old to ride along in a seat on a bike. In other states, children must be 12 months. Many manufacturers design seats that accommodate babies as young as nine months. However, pediatricians and bike safety experts emphasize that children who are not able to sit up on their own should not ride in a baby bicycle seat. 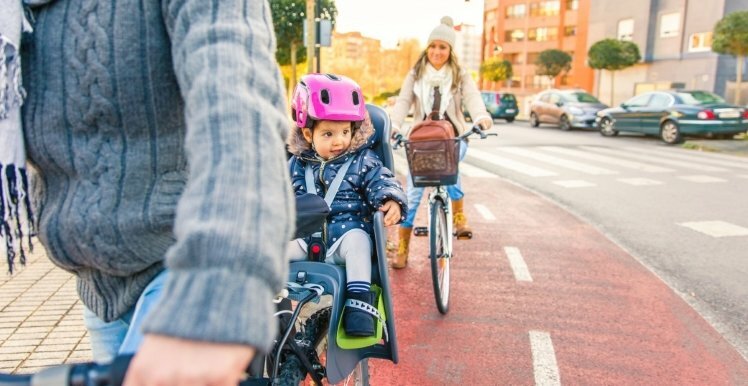 According to the American Academy of Pediatrics, children in bicycle mounted seats should be at least 12 months old and weigh less than 40 pounds. Youngsters should wear a bike helmet and bike trips with a child on the bike should be limited to bike paths, parks and streets with little to no traffic. The bottom line: Before buying, check your state’s law for age requirements. 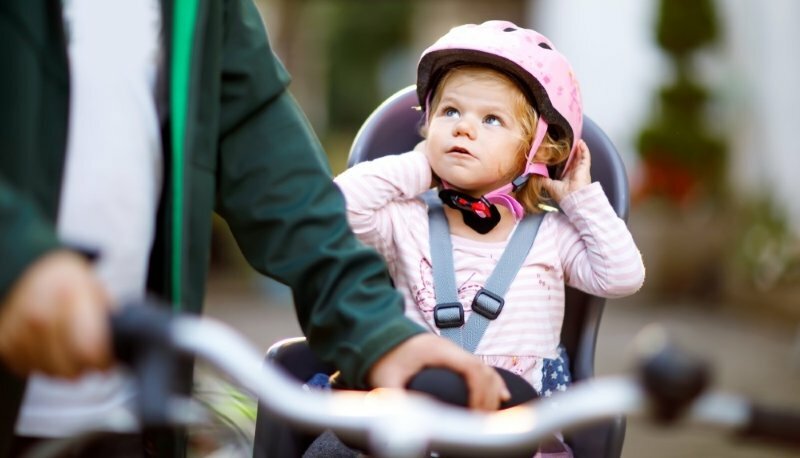 Does My Child Have to Wear a Bike Helmet in a Child Bike Seat? There is no federal law requiring helmets when bicycling. However, all U.S. states have bicycle helmet laws. Most states require children under age 18 to wear a safety helmet when riding a bike. While some laws do not state it specifically, anyone carried on a bicycle also should wear a helmet. Here’s why: Babies, toddlers and young children could suffer repeated brain trauma from their head bobbing around when riding over bumpy roads, in a crash, or if you and the bike fall. A helmet would keep your child’s head stable in these situations. In some states, riders could face two violations and double fines. One for not having a safety helmet on their child and one for endangering their child by not having them wear protective headgear. When shopping for a child safety helmet, it’s important to find the perfect fit for your child’s head. Also test that the weight of the helmet is not too much for your child. There are lightweight infant safety helmets, as well as those designed for baby bike seats that recline for sleeping. Some seats come with a safety helmet, but you may need to purchase another one as your child grows or if it’s not a perfect fit for your child’s head. The bottom line: Whether or not it’s a law in your state, it makes good safety sense to put a helmet on your child when in a bike carrier. Plus, it gets your child in the habit at a young age of wearing a safety helmet whenever on a bike. 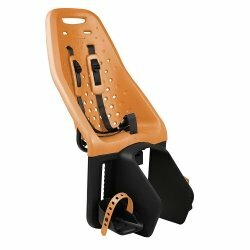 Do Baby Bike Seats Fit All Types of Bikes? Several manufacturers sell adapters and brackets specifically for bikes whose design makes it difficult to accommodate a child ride along seat. The bottom line: Read the installation requirements carefully. The complete manual is often available on the seat manufacturer’s website. Pay close attention to where the seat mounts, the measurements the bike frame has to be and the required space clearances between the seat and the bike’s frame or components. If you’re still not sure, contact the manufacturer and ask about your specific type of bike. Is Your Bike Compatible with a Child Bike Seat? In trying to accommodate all types of bikes, manufacturers have come up with three different types of baby bike seats: front frame, rear frame and rear rack. Here’s a look at each one, followed by the steps to take to determine whether your bike is compatible with it. This type is for youngsters ages 9 months to 3 years or up to 33 pounds. The seat mounts just below the handlebars, so the baby rides between your arms. These types of saddles are best for bikes where you ride upright, versus forward-leaning. 1. Check to see if there is a threaded locknut at the base of your handlebars. If there is, your bike has a threaded headset and should be compatible. If not, your bike has a threadless headset, where an internal bolt clamps the handlebars to the bike’s main (fork) tube. Usually, with threadless headsets, the base of the handlebars are too wide to fit the seat’s mounting bracket. You will need to purchase an adapter so the mounting bracket will fit. 2. Measure to see if there is room to mount the bracket below the handlebars. Using a measuring tape, measure the straight portion between the handlebars and the base. If this stem is between, 0.5 and 1.5 inches, then there is enough space for the seat’s mounting brackets. If there isn’t enough space, you need to buy a front frame carrier with a universal mount or an adapter to fit your measurement. 3. Measure to determine if the seat will fit. Using a measuring tape, measure the distance from the handlebars’ main tube to the seat tube. It needs to be over 20 inches to fit the unit and give your chest and knees plenty of room away from the seat. 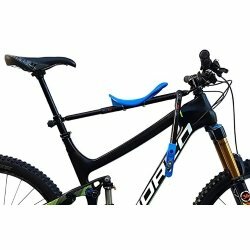 If there isn’t enough distance, your bike is not compatible for a front frame model. This type is ideal for longer bike rides and accommodates youngsters ages 9 months to 6 years or up to 48 pounds. It’s installed on the bike’s frame, minimizing the bounce when riding over bumps. They have more features than front frames, such as a recline position and an adjustable footrest. Check to see if your bike has cables running along the frame between the seat of your bike and the pedals. 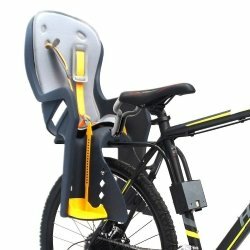 If so, this type of child seat is not compatible with your bike. Measure how close the seat of your bike is to the frame of the bike. There needs to be about two inches below the seat. If there isn’t, you will need a low saddle adapter to mount the rear frame baby bike seat. This type is mounted on a bike rack over the rear tire. It fits youngsters ages 9 months to 6 years or up to 50 pounds and is useful for longer rides where the child may fall asleep. If your bike already has a rear bike rack, check to see if its weight capacity is at least 60 pounds. 1. Check to see if your bike has two sets of eyelets on the frame to install a rack. If not, this type of baby seat is not compatible with your bike. 2. Check the type of brakes on your bike. If they are disc brakes, you need to purchase a rear rack baby bike carrier that has disc brake mounts. The Bottom Line: Take the time to check your bike to see which type of child seat will fit it. If you plan on interchanging the seat between other bikes, check all bikes to see if they will accommodate the same type of seat. Now that you’ve made the pre-shopping decisions and know which mount type you’re looking for, it’s time to shop the different brands to find the best baby bike seat for your child. Age and weight requirements differ greatly among baby bike saddles. This is an important consideration, especially if you are looking for a seat that will grow with your child. Some accommodate babies as young as nine months, while others require the child to be age 1 and older. Most seat types use weight rather than an end age. For example, some are designed to hold youngsters up to 48 pounds, while for others, the limit is much lower, like 33 pounds. Generally, rear frame and rear rack child seat types have the longest age and weight range than front frame seats. Seat design plays several roles. The first is comfort and support. There are several different seat designs, from low back to high back to none at all. Other seats have a high profile similar to a car seat, while others have a low profile. Another is functionality. Some seats have open air vents to allow for better air circulation and reduced wind drag. Others are solid all around. The material used in the seat’s design also matters in terms of weight. Some are made from lightweight polypropylene, while others are made with heavier hard molded plastic. Additionally, some material is both water repellent and water resistant. Suspension is what cushions the impact of bumps and rough terrain to provide a comfortable ride for your child. Front frame styles do not have a suspension system, but rear seats either have a spring system or a suspension bar. A spring system is located in the mounting bracket. It flexes 1 to 1-1/2 inches to absorb any impact. Suspension bars are located on the seat’s mounting bracket and provide greater absorption than springs, between 1 to 3 inches. If you plan on riding on dirt roads or unpaved trails, invest in a baby bike seat with a good suspension system. Safety harness: Some seats come with a 3-point harness, while others have the safer 5-point harness. Shoulder straps: These vary in design, but most are adjustable to accommodate the child’s growth. However, the design of some straps cause them to slip down. The best fit can be found with shoulder straps that adjust vertically, like those in a car seat. In terms of functionality, look for shoulder straps that you pull down to tighten or have a sliding adjustment system. They are easy to adjust than those you have to rethread through the buckle. Footrests and foot straps: Not only do they support your child’s legs and feet, they also keep them away from moving bicycle parts. However, not all seats are designed with footrests and foot straps. Those that are vary in length and functionality. The safest seats are those that offer height adjustable footrests with wide foot straps that are also adjustable and lock the feet in place. Bumpers: These are located along the sides of the seat and are made to protect your little one’s fingers from being hurt as you ride by trees, walls, poles, or other objects. Handlebar: This is one for the must-have category. A handlebar gives your child something to hold on to on bumpy trails or just somewhere to put his or her hands. Extra seat padding: Here’s another must-have, especially for long bike rides. Recline option: Some rear frame and rear rack mounted styles recline, so your youngster can nap on the ride. Recessed helmet pocket: Designed into the seat, this recessed area prevents your child’s head from moving forward and provides a more comfortable ride. Safety Helmet: This is a must-have accessory if it’s not included. Be sure to buy one that properly fits your child’s head. Lightweight safety helmets are available for smaller toddlers. Knee and elbow pad set: These pads ensure safe riding and provide your child with added protection in case of a fall. Windscreen: This is particularly beneficial for front frame models. It reduces the amount of wind blowing in your baby’s face. Sun and rain shade: This shield serves dual purposes, protecting your child from the sun’s rays or raindrops. Cup holder: This offers a convenient place to hold a drink or a small snack. 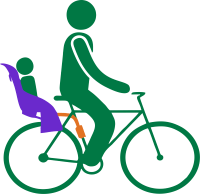 Bike riding with your child on your bike in a ride along seat is a great way to explore the outdoors together. To ensure an enjoyable riding experience, use this shopping guide to choose the best baby bike seat that’s the perfect fit for your bike. Remember, the right child bike seat makes all the difference in how safe and comfortable your child will be on your biking adventure. Happy riding!